A medical journal is calling for prescriptions of gluten-free food to be scrapped as they are costly and outdated. The Drug and Therapeutics Bulletin says that now such food is readily available it should not be a medical issue. Around 600,000 people in the UK have coeliac disease – caused by intolerance to gluten found in wheat. The charity Coeliac UK says prescriptions are essential due to the high cost of gluten-free staple foods. These can cost three to four times more than their gluten equivalents. The journal, which reviews medical treatment, asks if this type of prescription, which costs the NHS in England £27 million a year and involves a lot of administration, is the most up-to-date one. Prescriptions were introduced in the late 1960s when access to gluten-free foods was limited. These are now available in most big supermarkets. The NHS health regulator, NICE (The National Institute for Health and Clinical Excellence), is due to review the best way of treating people with coeliac disease in the most cost effective way later this year. The researchers in the journal said: “We would urge commissioners to consider redesigning services to ensure that there is ongoing support for people with coeliac disease and to remove the bureaucratic process of prescribing food from primary care. Sarah Sleet from Coeliac UK said they have considered vouchers but this type of scheme does have concerns. She said: “People with coeliac disease would ideally like to shop for their food like everyone else. “If we can address the cost and availability issues in retail shops there would not be the need for prescriptions. 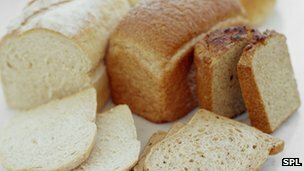 Coeliac disease is an autoimmune condition caused by intolerance to gluten – which can be found in foods like pasta, bread, cakes and cereals. One in 100 people in the UK have coeliac disease for which there is no cure and the only treatment is a strict adherence to a lifelong gluten-free diet. Left untreated coeliac disease can lead to serious health complications including malnutrition, osteoporosis, cancer of the small bowel and infertility problems. A Department of Health spokesman said: “A limited range of basic gluten-free food products are available on the NHS to help patients with coeliac disease to stick to a gluten-free diet.